Picture a skull and crossbones staring at you from the label of your potential beverage. Now picture the top of the skull cracked open exposing the oddly fresh brain inside of it. That my friend is what is currently staring into my soul on this label of Brain Wash. Brain Wash is made from the same fine folks that brought us Black Lemonade, one of the harshest beverages my throat ever dealt with. Just like Black Lemonade, Brain Wash has amusing blurbs on its label like “This may be your only way out!” and “May cause special effects”. Navy blue isn’t a color you usually associate with soda, but they’ve put enough Blue Dye #1 in this bad boy to reach that level. It has a lot of the same ingredients that Black Lemonade has with a few exceptions. 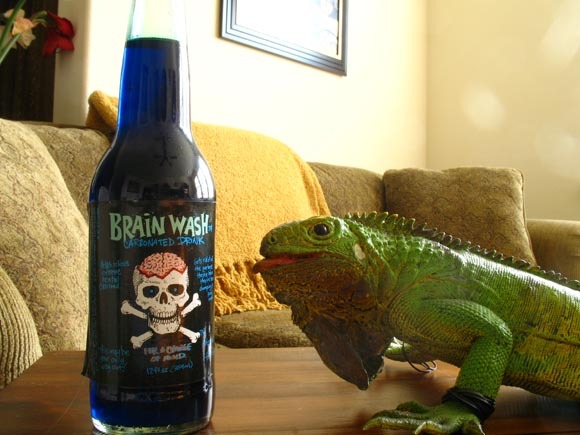 Brain Wash sadly uses HFCS instead of Cane Sugar, but on the plus side also uses Sage and Jalapeno Oil. I’m not sure how the sage will play a role in this performance, but I’m hoping the jalapeno oil is at least noticeable. Since Brain Wash isn’t exactly a flavor I’m a little curious as to what this will most taste like in the realm of real tastes. My initial guess is going to be a fruity ginger beverage that’s about to scald the back of my throat through the act of chemical warfare. Let’s find out, shall we? The initial odor I’m getting is that of green NyQuil which isn’t what you want to smell when you first open anything… except NyQuil of course. I will say that the bubbles forming in the neck of the bottle look rather nice when contrasted against the dark blue soda. Will they keep this from tasting like carbonated NyQuil? No, but hopefully something else does. Twist mocks you're extreme label with his own extreme...ness?